With the bookmarklet/addon/extension installed, navigate to a product page on a website of your choice (e.g. Amazon). 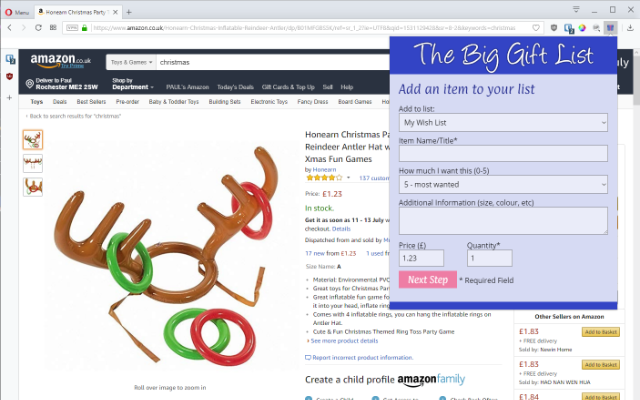 Once you've found an item you would like to add to one of your lists click the 'Big Gift List' button on your browsers toolbar (FireFox/Chrome/Opera), or the 'BigGiftList - Add Item' bookmarklet button on your browsers toolbar (Safari). A popup window will open. If this is the first time you've added a product since you opened the browser you will be asked to login to your BigGiftList account. Otherwise you will be taken directly to the next step. If you are new to the Big Gift List you will also be able to create a new account (this will take you to The Big Gift List website). You can now enter the details for the item as you would like to see it on your list, some of which will be pre-populated from the website. The form is identical to the one you would use on thebiggiftlist.com website. The Big Gift List will attempt to locate suitable images for the listing, if it is successful simply click the image you like to use for the item. Click Add Item when you are done. Providing you have filled in the form correctly you will be informed that the item has been successfully added to the list of your choice and will be shown a preview of the item listing; you can now click the 'Close' button to return to the main browser window.